Need to replace some Apple accessories for your phone? 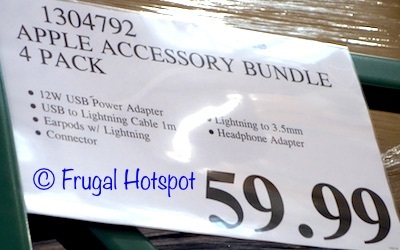 Select Costco locations have the Apple 4-Pack Accessory Bundle in stores for a limited time. 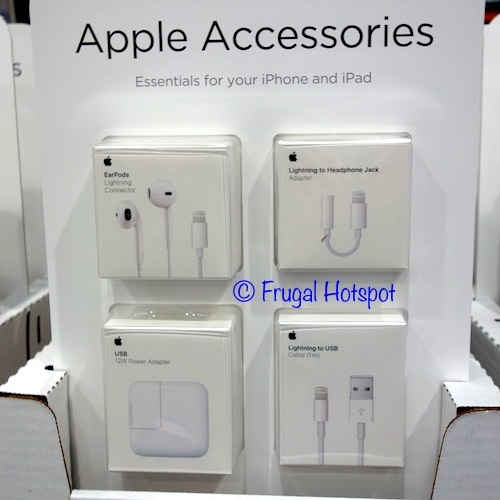 The set includes EarPods with Lightning Connector, Lightning to Headphone Jack adapter, USB 12W power adapter and a Lightning to USB cable. It’s priced at $59.99, which is a decent deal if you need all 4 items. This normally retails for $76. While supplies last. Item #1304792. It’s also available at costco.com for a very limited time, at a higher delivered price. • EarPods with Lightning Connector – includes a built-in remote that lets you adjust the volume, control the playback of music and video, and answer or end calls with a pinch of the cord. Works with all devices that have a Lightning connector and support iOS 10 or later, including iPod touch, iPad, and iPhone. • Apple 12W USB Power Adapter – charge your iPhone, iPad, or iPod with Lightning connector at home or whenever it’s not connected to a computer. You can connect the adapter directly to your device via the Lightning connector. • Lightning to USB 2.0 Cable (1 m) – connect your iPhone, iPad, or iPod with the Lightning connector to your computer’s USB port for syncing and charging. 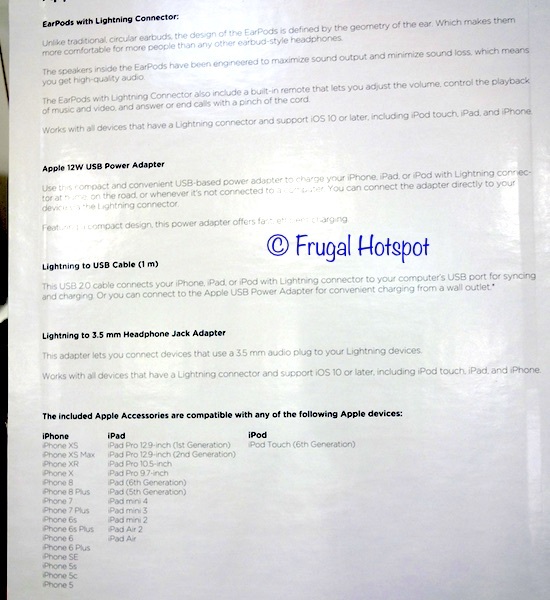 Or you can connect to the Apple USB Power Adapter to charge from a wall outlet. • Lightning to 3.5 mm Headphone Jack Adapter – connect devices that use a 3.5 mm audio plug to your Lightning devices. Works with all devices that have a Lightning connector and support iOS 10 or later, including iPod touch, iPad, and iPhone.